Crazy weather?! Not sure to make Easter plans? We’ve got you covered! Join us at our indoor Egg Hunt this April, Thursday the 18th at Glow Golf Amman. 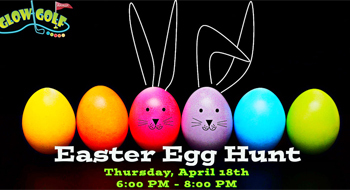 Egg hunting, Egg Painting, glow in the dark face paint and miniature golf fun!